alaTest has collected and analyzed 880 reviews of Bose Soundtouch 20 WIFI. The average rating for this product is 3.8/5, compared to an average rating of 4.6/5 for other Audio Systems for all reviews. People really like the design. The size also gets good opinions, whereas some have doubts about the reliability and price. We analyzed user and expert ratings, product age and more factors. 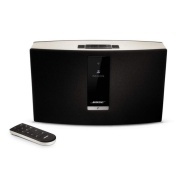 Compared to other Audio Systems the Bose Soundtouch 20 WIFI is awarded an overall alaScore™ of 93/100 = Excellent quality. The Bose SoundTouch 20 offers the convenience of both Wi-Fi and Airplay compatibility; includes Pandora, with more services on the way; high-quality sound from a quality unit. Missing key services like Spotify; no on-the-fly playlists; no FLAC, WAV, or OGG; no high-res support; no mute or pause button on unit; setup is fiddly. The Bose SoundTouch 20 is a likeable streaming speaker with capable performance and great sound, but it needs to support more music services. Over the years, Sonos, once a fledgling startup, has grown up to dominate the DIY multiroom wireless audio space. Now it has plenty of competition. Excellent sound for its size. SoundTouch app and presets are incredibly easy to use and set up. AirPlay support solves a lot of the potential problems of the app. Extremely limited selection of music services available through SoundTouch app. Requires a USB connection to set up. The is a great choice if you're looking for a single speaker for your home, but the new fills that role with a bit more panache. This speaker has warm and natural tonal qualities. It doesn't have great sound dispersion, so when you get outside of the sweet spot, the sound loses character and definition. If you don't want to spend the money to buy a speaker in our top three, the Bose SoundTouch 20 is a great alternative that provides good sound quality and lots of connectivity options.